I received a copy of this book from the publisher through Netgalley. This is my honest review. First off, I wish I'd realized this was the second book in a series (and it was probably made clear in the books description when I requested it, but I was so spellbound by the cover that I wasn't even paying attention to that). There was definitely some backstory I was missing out on, and while I felt like the major points that were necessary for this story to make sense were covered, I still felt like I was playing catch-up for most of this story. I think I probably missed out on some of the excitement of this story because I was playing catch-up. 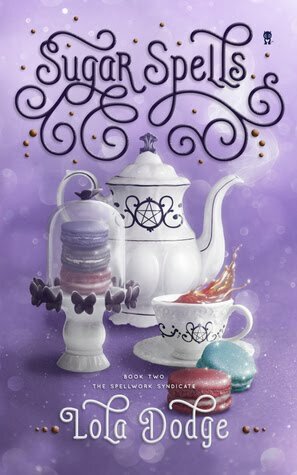 I was drawn to this book because it was pretty clearly about magic and baking, so I was disappointed to find out that there just wasn't a whole lot of baking going on, at least not the type of baking that would result in treats I would want to eat. Murder macarons just aren't high up on the list of things I plan on putting in my mouth. I found the different types of witches intriguing. Seeing their different affinities and how those affected their relationships with others was definitely unique. This was a different take on magic than what I'm used to, and it was a refreshing change of pace in that respect. I was anxious to see how Anise and Wynn would escape Girrar's clutches, and if Anise would succeed in freeing Wynn from his Shield contract. I definitely look forward to seeing how Anise's life changes now. Lola Dodge is a compulsive traveler, baker, and procrastinator. She earned her BA in English from Stonehill College and MFA in Writing Popular Fiction from Seton Hill University—and hasn’t stopped moving since. When she’s not on the road, Lola spends her time indoors where the sunlight can’t melt her, writing or bingeing on K-dramas and cherry soda. She can be summoned in a ritual involving curry, Hello Kitty idols, and a solid chocolate pentagram.